Black and white. 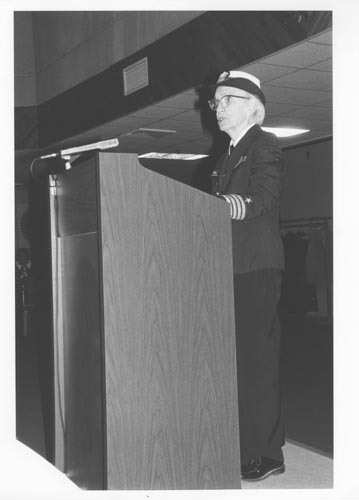 Close up view of Grace Hopper giving lecture. Verso label: "Captain Grace Hopper, US Navy giving lecture "On Howard Aiken and Harvard Mark I" 4/14/83 (Lecturn)" . Verso: "credit line" The Computer Museum"
Verso: " Please Return to The Computer Museum One Iron Way Marboro, MA 01752"